Palestinian children demonstrated at a sit-in on Tuesday in front of the United Nations High Commissioner for Refugees (UNHCR) in Gaza, in protest of the sentencing of 14-year-old Ahmad Manasra to 12 years in Israeli prison. 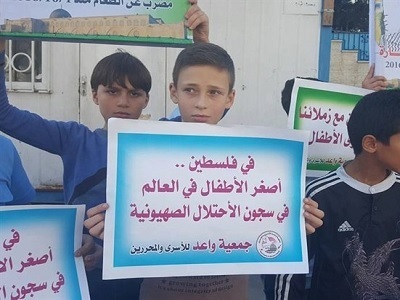 The children skipped their classes in order to participate in the sit-in, which was organized by the Waed Captive and Liberators Society group, and demanded that human rights organizations act against the sentencing of Manasra. “We left our classes today because they no longer have value amid our feelings of powerlessness to help Manasra,” Abd al-Karim, one of the children protesters, told Ma’an during the demonstration. Abd al-Karim stressed to Ma’an that Manasra’s sentencing was a “disgrace” for everyone who was involved in his prosecution. 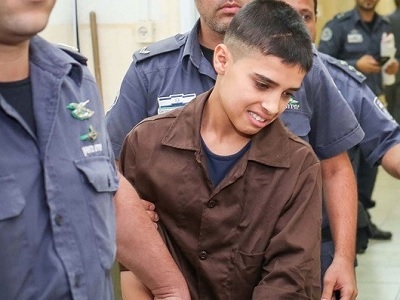 Manasra’s trial was postponed a number of times, which some commentators alleged was a conscious move to delay the case until he turned 14 in January, at which time he became old enough under Israeli law to be given a prison sentence.